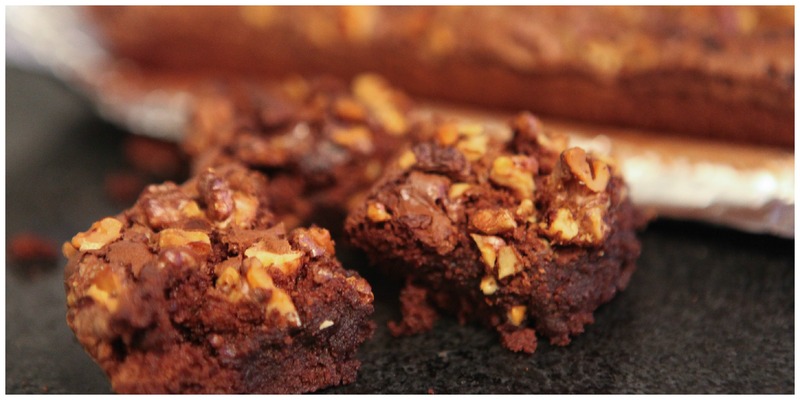 As this is the season and, unusually for Ireland, the weather for BBQ’s and picnics I want to repost this recipe for these amazingy luscious brownies, they are the perfect desert pack for a trip to the beach or park and a great offering to bring if you are invited to a pot luck BBQ. Enjoy! These brownies, adapted from a few different recipes were good, moist and dense with a rich chocolate flavour but still chewy and crisp at the same time. Studded with walnuts and milk chocolate chips these are scrumptious but do need to be accompanied by a cold glass of milk. I used milk chocolate for the chips as milk chocolate is more comforting to me than dark chocolate and there was a good 6 ounces of dark chocolate in the brownies already. There is a terrifying amount of sugar in the brownies but go with it and you won’t be disappointed, the sugar is what gives the brownies the crisp chewy top layer over the luscious chocolaty base. These brownies cook slowly at a low heat, they took one hour ten minutes in my oven but do check them over the last twenty minutes so you don’t over-cook them. Make sure the batter isn’t still wet but you do still want a few dense moist crumbs sticking to the skewer when you test them. • Line a 9” x 13” baking or roasting tin with tin foil and brush with a neutral tasting oil or melted butter. You need a baking tray that is at least 2” deep. • Melt the dark chocolate and the unsalted butter in a heatproof bowl set over some hot water. Stir once or twice until fully melted and combined. Remove from the heat. • Whisk the brown sugar in to the melted chocolate. • When the sugar is fully combined whisk in the eggs, one at a time, scrapping down the sides of the bowl to make sure everything is fully mixed. • Sift together the flour, salt and baking powder and fold in to the chocolate batter in two additions. • Pour the batter in to the prepped baking tray and scatter over the chopped walnuts and milk chocolate. If you batter is very thick you can press them slightly in to the batter. • Place the tray on the middle shelf of your oven and cook for at least 50 minutes and then check to see if the batter is cooked but not too dry. If there is any wet batter on your skewer then leave the brownies in the oven, check again in ten minutes. My brownie took one hour and ten minutes to cook through. What you want is for there to be no wet batter but some moist crumbs on the skewer when you test the brownies. 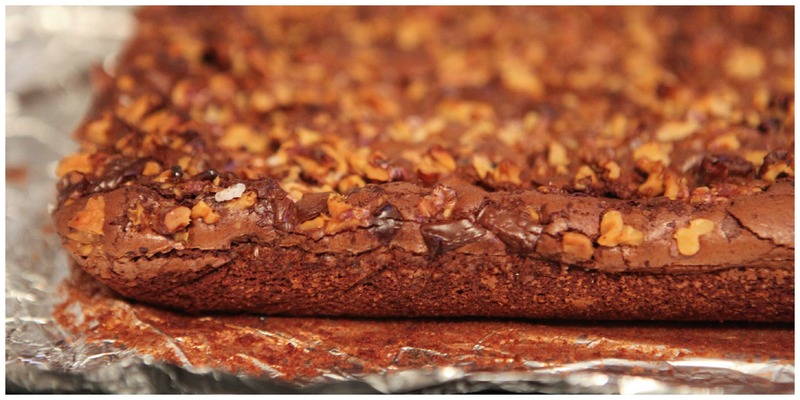 • Let the brownies sit in the tray for few minutes and then lift the brownies in their tinfoil from the tray and allow to cool fully or as long as you can before cutting in to squares. As I love the combination of salt and sweet I scattered a bit of Maldon salt on the top of the brownies with the walnuts and milk chocolate before baking but this is a personal preference and very optional.